Sitting is the new smoking. Have you heard this before? It's true: We are sitting way too much! In the car, at work, on the sofa. But we can take some small steps (literally) to be more active in our daily lives - especially our work life. How? Here are my 5 tips for adding more movement and activity at work. Recently, I watched a video about the habits of successful people. One thing quickly became clear to me: They get moving early. If you don’t feel like going for a walk or a run in the morning, then simply park a little farther away from the office. This is a habit I often incorporate into my daily routine. And, I simply love breathing in a little extra fresh air in the morning – it’s better than coffee. Sport's more fun together - so why not incorporate more fitness into your office schedule and workout as a team? Have you ever counted the number of hours you spend in meetings per week? SITTING? Even if you don’t know the exact number (who’s counting? ), one thing is certain: It’s definitely too many. That is why our Communications Team has started doing what we like to call a “walkie talkie.” This means that we hold some of our meetings while we walk together. 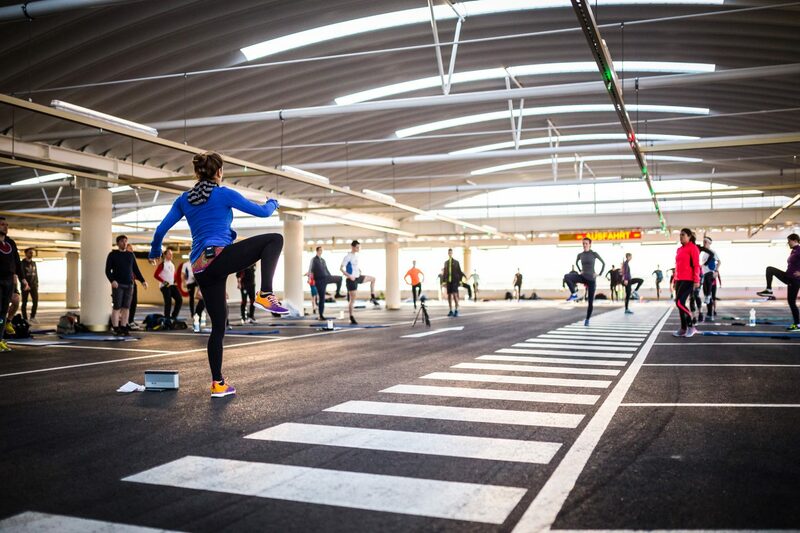 It’s a great way to add some variety to the work day and, of course, get moving a bit more. So, what’s stopping you from introducing them in your workplace? Create an active office environment. 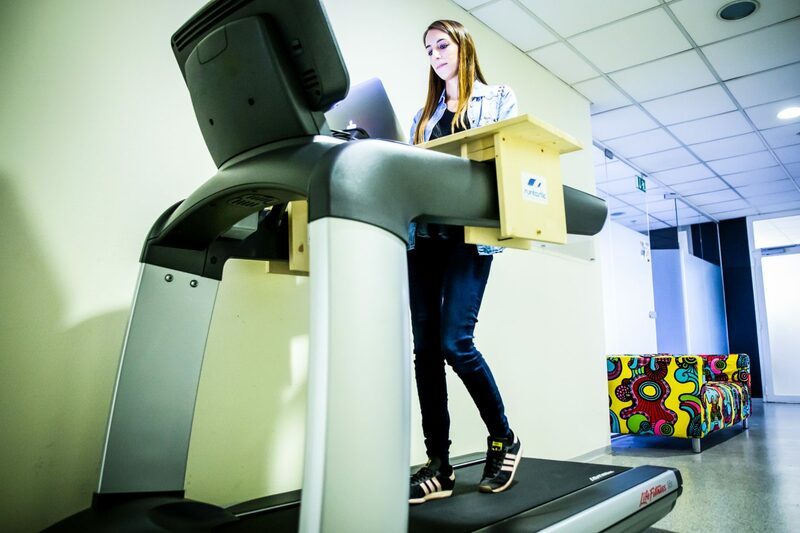 This self-made treadmill desk is a hit in our office. Did you know that standing up regularly can help you lose weight? Studies have shown that employees who regularly stand while working can lose up to 8.8 lb (4 kg) in just six months. lt doesn’t matter if you are making a call or having a meeting, the key is to stand up. Or how about using a treadmill desk? Some creative Runtastics got together and built one of our own. Every week, I try to spend at least a half hour on it while I work on my laptop. Since then, I have been climbing what feels like a million steps every morning. When I see my co-workers waiting in front of the elevator, I simply say, “I prefer to take the stairs.” As a result, some of them have developed a guilty conscience (or a newfound motivation) and now accompany me up the five flights of stairs. Mission accomplished! Do you have other tricks to keep you active during your work day? I'd love to hear them! And if you need an additional boost of motivation, check out the story "What would a champion do" by our community member Marcus Leach. Thank you for your suggestions I particular like the walky tally idea,. Oh wow! Never thought about this one. It is very simple as idea and can make a huge difference. I will definitely suggest it in my workplace! I can only agree. Tina's tips are easy and smart. Did your colleagues like the suggestions?! I cross my fingers that you can start your work year in a fresh and sporty manner. I want one of those invented laptop "desks" for the treadmill what a wonderful way to stay fit at home and at work! Thank you for these great tips! Get up and move. Take a walk, dance, walk up and down the stairs a few times. Get a standup/sitdown desk. I use an app call MotivAider to remind me to move!